Robert Redford is without a doubt a Hollywood icon, a movie star among movie stars. Some of his notable roles have been Butch Cassidy and the Sundance Kid, The Sting, The Great Gatsby and my personal favorite The Great Waldo Pepper. Though he’s not working as frequently as he used to, Redford still does about a film every couple of years (thank the Gods), and his latest is All Is Lost. In the beginning, we hear the words that the man writes in a journal – words of hopelessness, proclaiming his desperation. Then the film goes back eight days. Our man (his name is never given) is in the Indian Ocean on a one-man sailing trip. He seems to be a competent seaman but even the best sailor can run into problems. As the film opens, his cabin is full of water. A shipping crate has fallen off the side of a passing vessel and slammed into his hull, which has been breached and he is in trouble. The man works steadfastly to repair his vessel on the water and pump the excess fluids out of the interior. The water shorts out his electrical system so he must manually get the brackish liquid from his boat. Eventually, he is able to give a makeshift patch to his vessel. It will not make it to the shore but it still floats. He knows that he must get into the shipping lanes in order to be rescued. He plots out his course, guessing where the lane is and how far he must travel. It is a race against time and the elements for survival. The film builds excitement as the man waits for a cargo vessel to notice him. If Hemmingway were alive today, he would have written All Is Lost. It is about man versus nature and man verses himself. This is not a namby-pamby individual but a real man fighting real elements while still trying to keep sane. It is methodical exploration of the step by step process of survival. Much like the writing of Hemmingway, the writing here takes a basic step-by-step approach to survival. 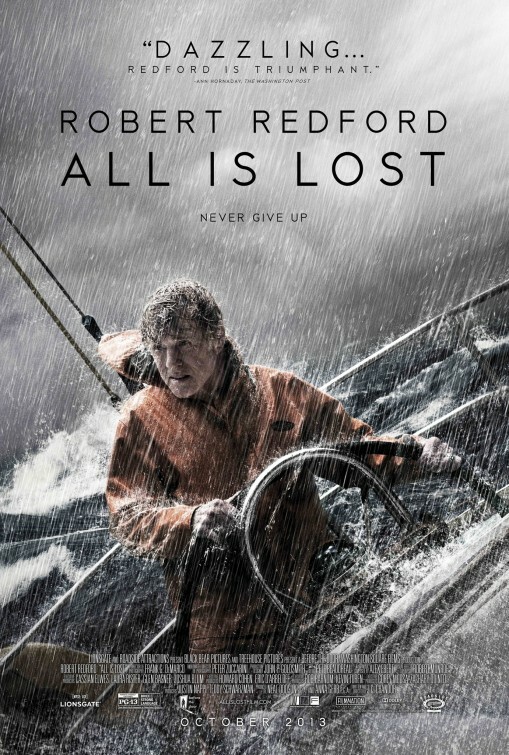 Robert Redford gives the performance of a lifetime with All Is Lost. The film is almost a silent movie with maybe three sentences spoken in almost two hours. It is all done with slight glances and stoic resolve. We are never given a back story with the character. The film just starts and goes through the mishaps without ever revealing anything about life before our hero set sail. There is no statement of how or why in the narrative. Writer/director J.C. Chandor has made a simple film of survival and blended it with introspective silent drama. By using only his camera to tell the tale, the director uses the idea of visual feast rather than talking heads to weave the tale. It is confident filmmaking that shows a skill seldom seen anymore… and the seascapes are frighteningly beautiful. One of my favorite books is “The Cocoanut Book” by Richard Maynard. The tome is about a man trapped on a desert island. It is not Robinson Crusoe but a harsh reality of isolation and despair. All Is Lost follows the same kind of idea. It is not an adventure tale but a story of impossible survival. This is not a film that will be universally accepted and praised but it is a film that is different from 99.9% of what is shown on the silver screen. All Is Lost is one of the most unique cinema experiences of 2013, and itt should absolutely get Robert Redford an Oscar nomination for Best Actor. While not the best film of the year, it easily has one of the best performances.